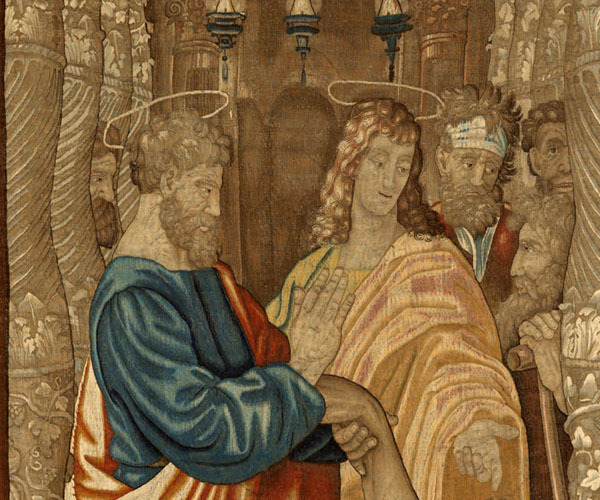 This tapestry, one of the many re-editions of the Acts of the Apostles series which was made to decorate the Sistine Chapel, was probably commissioned by the Archdukes Albert of Austria and Isabella Clara Eugenia to the Brussels workshop of Jan Raes, who had to become partners with Jakob Geubels II to handle a job of such importance. The cloths were used to decorate the church of the Royal Monastery of La Encarnación (Madrid), established by Margaret of Austria, the wife of Philip III. 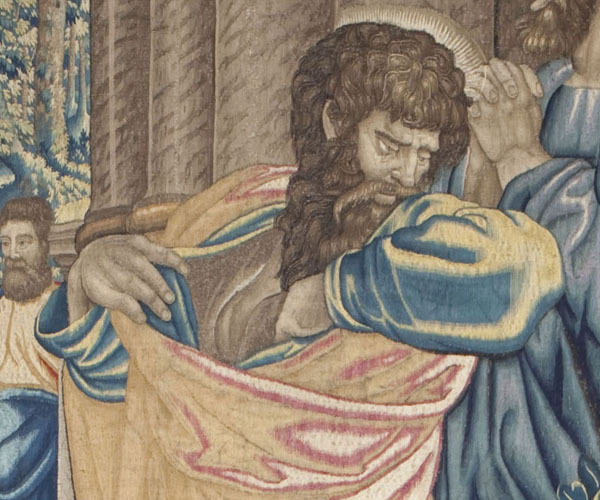 They were hung during Easter ceremonies, in the festivities for the apostles Peter and Paul, in those of protomartyr Saint Stephen and of Saint Augustine, father of the Latin Church, as well as in those of the conversion of Saint Paul, the Apostle to the Gentiles. It is quite likely that the tapestries were arranged along the cornice of the nave, given their height and the cuts in which they were split. The series remained in the Augustine convent until its extinction owing to the disentailment of church properties, being then incorporated to the Office of Tapestry of the Royal Palace. 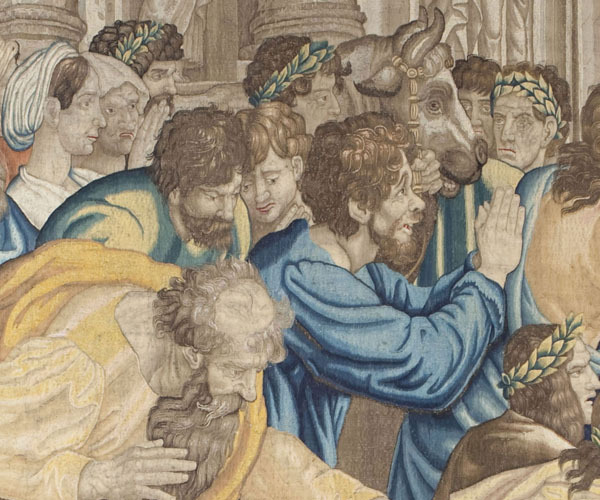 Although the suppression order of the monastery was reversed, the tapestries were never taken back. 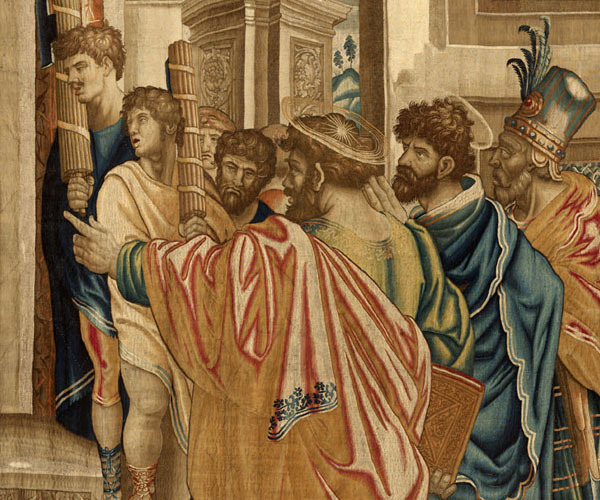 For the first edition of this series, ten cartoons were commissioned to Raphael by Pope Leo X in orderto complete the decoration of the Sistine Chapel with a tapestry woven in the workshop of the acclaimed weaver Pieter van Aelst. Only seven of them have made it to our days. They were purchased by the British crown in the 17th c., under recommendation of Pieter Paul Rubens, so they now belong to the Queen of England and are deposited in the Victoria & Albert Museum of London. Two series of the Acts of the Apostles are kept in the National Heritage collection. 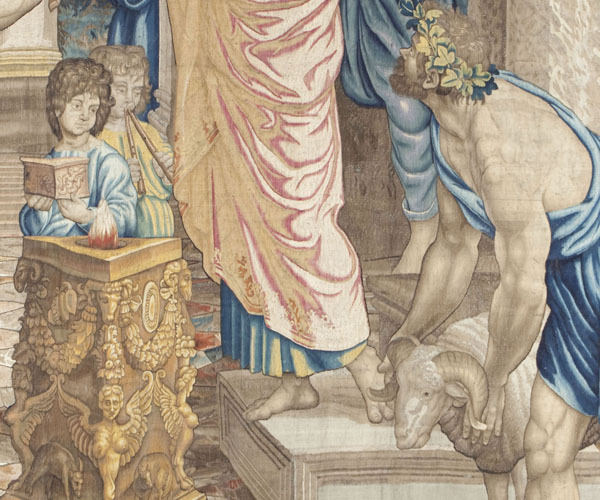 One was woven for Philip II in the Brussels workshop of Johann van Tieghen towards 1530, and the second one is a re-edition which includes Saint Paul and Saint Barnabas in Lystra. Even if the series originates from the collection of Philip III, it was inventoried for the first time in the will of Philip IV, and has been linked to the royal collection since then. - P. Junquera de Vega y C. Díaz Gallegos, Catálogo de Tapices de Patrimonio Nacional. Volumen II: Siglo XVII. Madrid, Patrimonio Nacional, 1986, pp. 62-74. 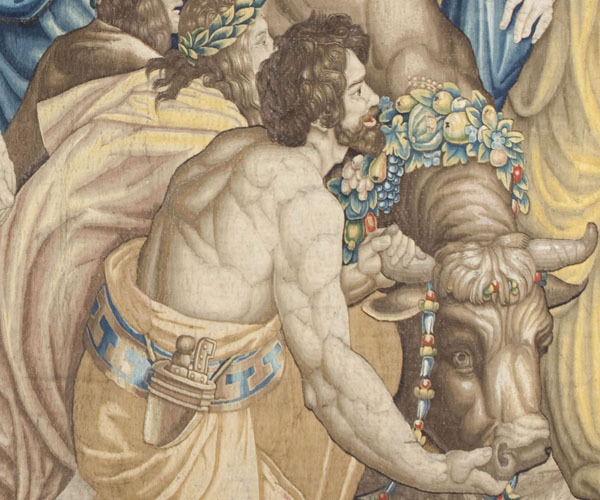 - M. Evans y C. Browne, Raphael Cartoons and Tapestries for the Sistine Chapel. Londres, V&A Publishing, 2010, pp. 110-115.